Here Are The 24 Heroic Stories Behind Today's Medals Of Honor : The Two-Way At the White House, the nation's highest honor for valor in action went to 24 men — three of whom are still alive. Most were Jewish or Hispanic and had been unfairly passed over. This post was updated at 4:09 p.m. ET. 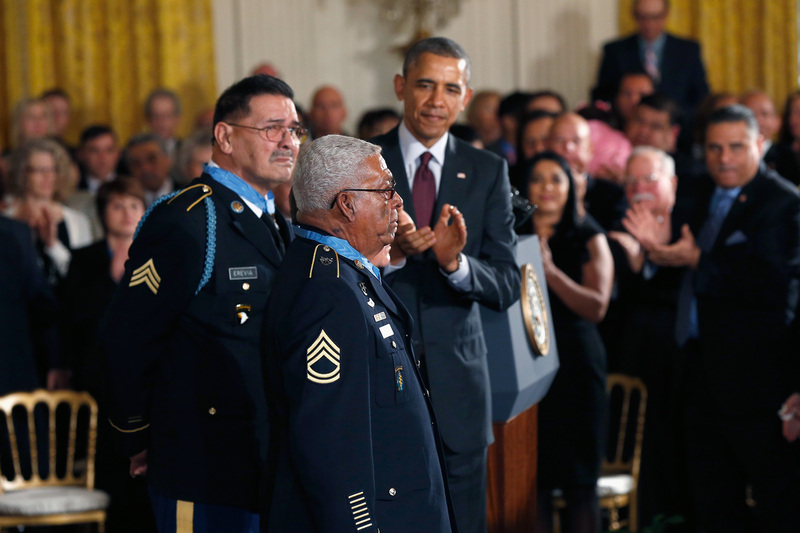 Vietnam veterans Melvin Morris (center), Jose Rodela (obscured) and Santiago J. Erevia (left) received the Medal of Honor from President Obama at the White House on Thursday. Old wrongs were righted Tuesday afternoon, as The Associated Press says, when President Obama awarded the Medal of Honor to 24 Army veterans. The men served either during World War II or during the wars in Korea and Vietnam. Just three are still alive. All are finally being recognized for their heroic acts "after Congress ordered a review to determine whether service members of Jewish or Hispanic heritage or others had been wrongly denied the Medal of Honor due to prejudice," the AP writes. That review also turned up several men who were not of Jewish or Hispanic heritage, but were judged to be worthy of the nation's highest honor for valor in action. During the ceremony at the White House, President Obama said it is events like these that make the United States exceptional. No nation is perfect, Obama said, but the United States goes through great lengths to acknowledge and try to fix its sometimes ugly past. "This is the length the U.S. will go so everyone gets the thanks that they deserve," Obama said. On Morning Edition, NPR's Tom Bowman told the story of Vietnam War veteran Santiago Erevia, who risked his life in May 1969 when he charged four North Vietnamese bunkers. -- Pvt. Pedro Cano "is being recognized for his valorous actions in the months-long battle of Hurtgen Forest. He was advancing with his company near Schevenhütte, Germany, in December 1944, when the unit met heavy enemy resistance. During a two-day period, Cano eliminated nearly 30 enemy troops. Sometime later, while on patrol, Cano and his platoon were surprised by German soldiers that caused numerous casualties within their platoon. Cano lay motionless on the ground until the assailants closed in, then tossed a grenade into their midst, wounding or killing all of them. It was in this engagement, or shortly thereafter, that Cano sustained serious injuries." He died in 1950. -- Pvt. Joe Gandara "is being recognized for his heroic actions on June 9, 1944, in Amfreville, France. His detachment came under devastating enemy fire from a strong German force, pinning the men to the ground for a period of four hours. Gandara advanced voluntarily and alone toward the enemy position and destroyed three hostile machine-guns before he was fatally wounded." -- Staff Sgt. Salvador J. Lara "is being recognized for his valorous actions in Aprilia, Italy, May 27-28, 1944. During the fight, May 27, he aggressively led his rifle squad in neutralizing multiple enemy strong points and inflicting large numbers of casualties on the enemy. The next morning, as his company resumed the attack, Lara sustained a severe leg wound, but did not stop to receive first aid. Lara continued his exemplary performance until he captured his objective." He is deceased. -- Staff. Sgt. William F. Leonard "is being recognized for his valorous actions while serving as a squad leader with Company C, 30th Infantry, on Nov. 7, 1944, near St. Die, France. Leonard's platoon was reduced to eight men by blistering artillery, mortar, machine-gun, and rifle power. Leonard led the survivors in an assault over a tree-and-shrub-covered hill, continuously swept by automatic fire. Killing two snipers at ranges of 50 and 75 yards, he disregarded bullets that pierced his back to engage and destroy a machine-gun with rifle grenades, killing its two-man crew. Stunned by an exploding bazooka shell, he continued his relentless advance to knock out a second a machine-gun and capture the roadblock objective." He died in 1985. -- Master Sgt. Manuel V. Mendoza "is being recognized for his actions on Oct. 4, 1944, in Mt. Battaglia, Italy, where he is credited with single-handedly breaking up a German counterattack." A longer Army account of his actions says that "the enemy launched a violent counterattack preceded by a heavy mortar barrage. Mendoza, already wounded in the arm and leg, grabbed a Thompson sub-machine-gun and ran to the crest of the hill, where he saw approximately 200 enemy troops charging up the slopes employing flame-throwers, machine pistols, rifles, and hand grenades. Mendoza immediately began to engage the enemy, firing five clips and killing 10 enemy soldiers." He died at the age of 79. -- Sgt. Alfred B. Nietzel "is being recognized for his valorous actions in Heistern, Germany, Nov. 18, 1944. When an enemy assault threatened to overrun his unit's position, Nietzel selflessly covered for the retreating members of his squad, expending all his ammunition and holding his post until he was killed by an enemy hand grenade." -- 1st Lt. Donald K. Schwab "distinguished himself by exceptionally valorous actions on Sept. 17, 1944. His courage and determination resulted in the dismantling of a strong German position and he would take one prisoner of war." According to a longer account of his valor, "on Sept. 17, 1944, at about 2 p.m. near Lure, France, Schwab led his company over 400 yards of bare, coverless ground against a formidable line of machine-guns and machine-pistols. Meeting intense, grazing fire, which burst without warning from a fringe of woods directly to his front, Schwab extricated his men from the attempted ambush and led them back to a defiladed position." He died in 2005. -- Cpl. Joe R. Baldonado "distinguished himself on Nov. 25, 1950, while serving as a machine-gunner in the vicinity of Kangdong, Korea. Baldonado's platoon was occupying Hill 171 when the enemy attacked, attempting to take their position. Baldonado held an exposed position, cutting down wave after wave of enemy troops even as they targeted attacks on his position. During the final assault by the enemy, a grenade landed near Baldanado's gun, killing him instantly." -- Sgt. Victor H. Espinoza "is being recognized for his actions on Aug. 1, 1952, at Chorwon, Korea. While spearheading an attack to secure 'Old Baldy,' Espinoza's unit was pinned down by withering fire from fortified positions. In daring succession, Espinoza single-handedly silenced a machine-gun and its crew, discovered and destroyed a covert enemy tunnel, and wiped out two bunkers." He died in 1986. -- Sgt. 1st Class Eduardo Corral Gomez "distinguished himself by defending his company as it was ruthlessly attacked by a hostile force. Notably, Gomez maneuvered across open ground to successfully assault a manned tank. Wounded during his retreat from the tank, Gomez refused medical attention, instead manning his post and firing upon the enemy until his company formed a defensive perimeter." He is deceased. -- Pfc. Leonard M. Kravitz "is being recognized for his actions in Yangpyong, Korea, March 6-7, 1951. While occupying defensive positions, Kravitz's unit was overrun by enemy combatants and forced to withdraw. Kravitz voluntarily remained at a machine-gun position to provide suppressive fire for the retreating troops. This forced the enemy to concentrate their attack on his own position. Kravitz ultimately did not survive the attack, but his actions saved his entire platoon." -- Master Sgt. Juan E. Negron "distinguished himself on April 28, 1951, for actions near Kalma-Eri, Korea. Negron held the most vulnerable position on his company's exposed right flank after an enemy force had overrun a section of the line. He held the position throughout the night, accurately hurling hand grenades at short range when hostile troops approached his position." He is deceased. -- Master Sgt. Mike C. Pena "is being recognized for his actions on the evening of Sept. 4, 1950, near Waegwan, Korea, when his unit was fiercely attacked. During the course of the counter-attack, Pena realized that their ammunition was running out, and ordered his unit to retreat. Pena then manned a machine-gun to cover their withdrawal. He single-handedly held back the enemy until morning when his position was overrun, and he was killed." -- Pfc. Demensio Rivera "is being recognized for his actions at Changyongni, Korea, May 22-23, 1951. When the outpost area occupied by his platoon was assaulted during the night, Rivera, an automatic rifleman, held his forward position tenaciously, although exposed to very heavy fire. When his rifle became inoperative, Rivera employed his pistol and grenades, and eventually fought the enemy hand-to-hand and forced them back." He is deceased. -- Pfc. Miguel A. Vera "is being recognized for his heroic actions at Chorwon, Korea, Sept. 21, 1952. While Vera's unit attempted to retake the right sector of 'Old Baldy,' they came under heavy fire at close range and were forced back. Vera selflessly chose to stay behind and cover the troop's withdrawal, and lost his life during this action." According to a longer account, Vera had been "wounded in an earlier engagement, [but] voluntarily rejoined elements of the platoon regrouping at the base of the hill to resume the attack. ... He selflessly remained behind to cover the withdrawal and, maintaining a determined stand, poured crippling fire into enemy emplacements." -- Sgt. Jack Weinstein "is being recognized for his exceptionally valorous actions on Oct. 19, 1951, in the vicinity of Kumson, Korea, when his platoon came under enemy attack. He volunteered to stay back and provide cover while his men withdrew from their positions. Weinstein killed six enemy combatants and, after running out of ammunition, used enemy grenades around him to keep the enemy forces back. Weinstein held his position until friendly forces moved back in and pushed the enemy back." He died in 2006. -- Spc. 4 Leonard L. Alvarado "distinguished himself on Aug. 12, 1969, while serving as a rifleman during a mission to relieve a sister platoon, in Phuoc Long Province, Vietnam. Alvarado was killed in action after disrupting an enemy raid and saving the lives of several comrades." A longer account says that during the battle, Alvardo was "repeatedly thrown to the ground by exploding satchel charges, [but] continued advancing and firing, silencing several emplacements, including one enemy machine-gun position." -- Staff Sgt. Felix M. Conde-Falcon "distinguished himself on April 4, 1969, while serving as a platoon leader during a sweep operation in the vicinity of Ap Tan Hoa, Vietnam, April 4, 1969. Conde-Falcon was killed in action that day after destroying multiple enemy bunkers and demonstrating extraordinary leadership under fire." The Army's longer account says that "carrying a machine-gun, he single-handedly assaulted the nearest fortification, killing the enemy inside before running out of ammunition. After returning to ... three men with his empty weapon and taking up an M-16 rifle, he concentrated on the next bunker. Within 10 meters of his goal, he was shot by an unseen assailant and soon died of his wounds." -- Sgt. 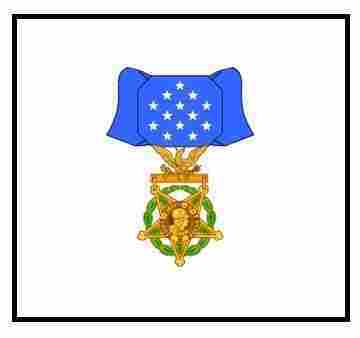 Ardie R. Copas "distinguished himself on May 12, 1970, while serving as a machine-gunner near Ph Romeas Hek, Cambodia. When his convoy was ambushed, Copas repelled the enemy under heavy fire, holding his post while his wounded comrades were evacuated. Copas was killed in action." The Army's longer account says that "ignoring his own wounds, Copas quickly remounted [a] burning vehicle and commenced firing his machine-gun at the belligerents. Braving the hostile fire directed at him, and the possible detonation of the mortar rounds inside the track, Copas maintained a heavy volume of suppressive fire on the foe while the wounded Americans were safely evacuated." -- Sgt. Jesus S. Duran "distinguished himself on April 10, 1969, as a machine-gunner on a search and clear operation. His actions saved several wounded Americans and led to the enemy's retreat." A longer account of his valor say that "learning that two seriously wounded troopers lay helplessly pinned down under harassing fire, he assaulted the suppressive enemy positions, firing deadly bursts on the run. Mounting a log, he fired directly into the enemy's foxholes and eliminated four of them and several others as they fled. He then continued to pour effective fire on the disorganized and fleeing enemy." He is deceased. -- Sgt. Santiago J. Erevia "distinguished himself May 21, 1969, while serving as a radio-telephone operator during a search-and-clear mission near Tam Ky City, in the Republic of Vietnam." A longer account of his valor includes this passage: "Under a hail of enemy fire, he continued to advance until he reached a location a few feet short of the first insurgent position. Disregarding the fire directed at him from the remaining bunkers, he pulled the pin on a hand grenade and advanced on the bunker, firing his rifles until he dropped the grenade into the bunker, thus destroying the fortification and killing the enemy soldier within." He lives in San Antonio. -- Sgt. Candelario Garcia "distinguished himself on Dec. 8, 1968, as a team leader during a reconnaissance-in-force mission near Lai Khe, Vietnam. Garcia destroyed two enemy machine-gun positions in an attempt to aid casualties that were in the open and under fire. Garcia then rejoined his company in a successful assault on the remaining enemy positions." He died in 2013. -- Sgt. 1st Class Melvin Morris "is being recognized for his valorous actions on Sept. 17, 1969, while commanding the Third Company, Third Battalion of the IV Mobile Strike Force near Chi Lang. Then-Staff Sgt. Morris led an advance across enemy lines to retrieve a fallen comrade and single-handedly destroyed an enemy force that had pinned his battalion from a series of bunkers. Staff Sgt. Morris was shot three times as he ran back toward friendly lines with the American casualties, but did not stop until he reached safety." He lives in Cocoa, Fla.
-- Master Sgt. Jose Rodela "is being recognized for his valorous actions on Sept. 1, 1969, while serving as the company commander in Phuoc Long Province, Vietnam. Rodela commanded his company throughout 18 hours of continuous contact when his battalion was attacked and taking heavy casualties. Throughout the battle, in spite of his wounds, Rodela repeatedly exposed himself to enemy fire to attend to the fallen and eliminate an enemy rocket position." He lives in San Antonio.